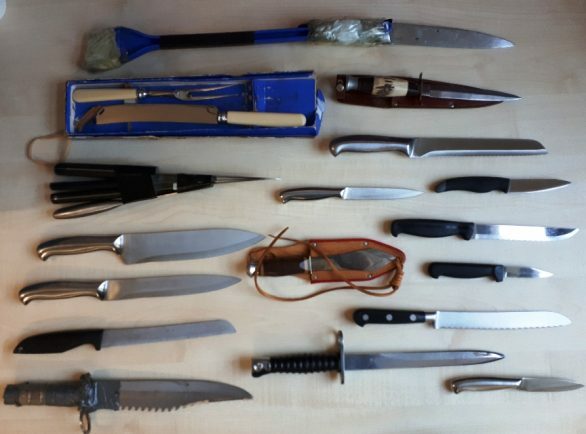 SOME 20 knives were handed in to Leamington station as part of a knife surrender campaign. The four-week campaign, which has now ended, gave anyone with a knife in Warwickshire and West Mercia the opportunity to surrender it anonymously. A total of 20 knives were handed in at Leamington as part of Operation Sceptre – a national campaign to reduce knife crime. All the knives surrendered will be delivered to the British Ironwork Centre in Oswestry where they will be used to build a plinth for a 20-foot high guardian angel sculpture in memory of those who have lost their life to knife crime. Chf Insp Sharon Canning said: “The streets of the Warwickshire and West Mercia policing areas are safer following this campaign. Each knife surrendered represents one less chance of another life being ended or ruined by knife crime.